Even if you’ve never been on a franchise’s forecourt, the chances are that you’ve heard of Arnold Clark. In case you haven’t, it is a huge company with 24 VM brands in it’s dealer group, that has branches dotted all over the UK. The scale of the business was a point proven to us when we were given a tour of the vast and labyrinthine Head Office in Glasgow, which fittingly is integrated with one of the dealer’s 200 branches. However, it isn’t the huge office that we are here to see, nor are we in town to visit the firm’s training facilities. 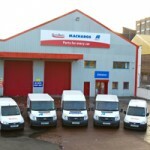 Instead, our trip is to the former Albion truck and bus factory in Scotstoun, which for many years has been home to Arnold Clark’s aftermarket factor business, Autoparts UK. As you might expect from a building where double-decker buses were once produced, it is very large and solidly constructed with ornate cast iron pieces stretching to the roof. There’s a large mezzanine and there is ample room for all of the sales team inside the former administrative quarters. It’s in here that we meet the Group Factor Manager, Craig McCracken who explained how it was that a company that has its main business in new car franchises has an all-makes aftermarket factor chain attached to it. “We started with Unipart Express Factors, because in those days an Express Factors branch was always coupled to a Rover dealership” McCracken explained. At the time Arnold Clark had a Rover Group franchise, though the Express Factors network was an all-makes programme. McCracken started the first Express Factors branch to be located in a Nissan dealership, but the landscape changed when Unipart took the decision to buy Partco/Brown Brothers. “We took the decision that we might be ‘feeding the hand that was about to bite us’, so to speak” explained McCracken. “We decided to do our own thing separately and line up our own suppliers”. With that, the Autoparts UK brand was established in October 1992. Thanks to the team’s experience and backing there was no problem with securing stock from the best suppliers in the market including Valeo, Kilen and Sogefi etc. In addition the company has always offered a tier of products under various ‘house brand’ labels including Padtech, Goliath and Dynamach which also do very well. “With our own brand products, we always try to make them equal to, if not better than the premium product” McCracken says, explaining that contract to supply oil, for example, is put out to tender every three years and the product is monitored to ensure consistent quality. 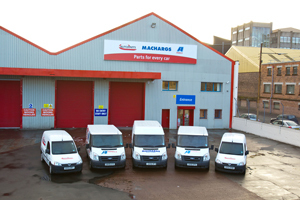 Today, Autoparts now consists of twelve branches, ranging from Inverness on the North coast of the Scottish Highlands, to Stoke-on-Trent in the Midlands. Three years ago, a second chain, Midwest Motor Factors was acquired with half a dozen branches that also fall under McCracken’s jurisdiction. The growth is unlikely to stop there as McCracken has plans to expand further and is on the hunt for any businesses that might be considering selling. Unlike most all-make parts factors, Autoparts UK also supplies body panels to the crash repair market and more recently it has introduced a range of tyres. Like some other factors, Autoparts UK offers customers a garage management system, which allows them to manage daily booking and check stock online. McCracken says that the system is popular with regular customers, though only a minority use it for actually ording parts. “They can order parts through it, but the main thing (for them) is getting accurate service schedules” he explained, adding that in the event of a dispute with a VM, the garage will need to prove that the vehicle has been serviced in line with the manufacturer’s schedules, and that the software will advise on exactly when, and what parts are needed at certain intervals. The system is also handy for sending out MOT and timing belt reminders to customers. McCracken has always been a fan of selling everything needed to complete a job in one go. For example, when selling catalytic converters he noticed that the team struggled to get garages to take all the accessories needed to fit the part at the same time. “The main problem was that when you sold someone a cat then added a fitting kit at £26 on top it was difficult” explained McCracken. “So we did a deal with a manufacturer to include the kit in the price. We sometimes get customers saying that we are slightly more expensive, but when we explain that they are getting over £20 of fitting kit in the price, it usually works in our favour”. Price is a crucial point everywhere, but especially here in Glasgow, where several factors are competing for the same patch. “If you’re not competitive, your customer will go to the competitor” he explains, adding that availability, product quality and delivery speed are now areas where there is little to choose between one factor and another in the local area. On the subject of how ‘independent’ can an independent factor be if it is owned by the holder of dealer franchises, McCracken said: “Our competitors will try and use it against us, but ultimately the garages we serve are charging around £40 p/h and working on vehicles that are five years plus, where dealerships are charging £90 per hour”. “Last year, AC sold 297,000 vehicles. We are the food chain for the aftermarket. Is someone going to bring a six year old Dacia back to the dealer for a set of brakes, an exhaust and a clutch? No. It’s never really been an issue, I’ve never lost any business out of it”.